Two independent research teams have reported that the deluge from Hurricane Harvey was significantly heavier than it would have been before the era of human-caused global warming. NEW ORLEANS — There’s a theme lurking under the giant science meeting here along the Mississippi River: Extreme weather really is getting more extreme because of climate change. The human influence on hurricanes and wildfires is increasingly obvious. For years this has been a subject clouded in uncertainties. But now scientists say they have hard numbers. Wednesday morning two independent research teams, one based in the Netherlands and the other in California, reported that the deluge from Hurricane Harvey was significantly heavier than it would have been before the era of human-caused global warming. One paper put the best estimate of the increase in precipitation at 15 percent. The other said climate change increased rainfall by 19 percent at least — with a best estimate of 38 percent. Meanwhile another team of scientists released a blockbuster report on extreme weather in 2016, saying that for the first time they could declare that three separate weather events — the weirdly warm “blob” of water off the Alaska coast, a heat wave in Asia and the record global warmth — would have been impossible without human-caused climate change. “Attribution” research, as it’s known, seeks to find and quantify the influence of climate change on a weather event, which has always been problematic. There’s a truism: Climate is what you expect and weather is what you get. Weather events emerge from chaotic forces and elements, and there is variability from place to place and year to year. The result has been an ongoing issue for scientists studying extreme weather and journalists reporting on the subject. Definitive statements about causality, or the magnitude of an effect, are hard to come by. The discussion gets mired in caveats, because extreme events can happen with or without a changed climate. More scientists are on the case, and a warmer world is delivering more extreme events. “The signal over the noise is larger, so it’s getting easier to find it,” said Karin van der Wiel, a researcher at the Royal Netherlands Meteorological Institute who co-wrote one of the papers published Wednesday. “This job gets easier over time, unfortunately,” added Michael Wehner, senior staff scientist at the Lawrence Berkeley National Laboratory and co-author of the other Hurricane Harvey study. There’s a buy-more-sandbags message lurking amid the sessions here at the AGU meeting. It’s a sprawling science meeting, physically and intellectually: As of Wednesday morning 22,500 people had registered and more are coming in, including experts on volcanoes, earthquakes, glaciers, the atmosphere, Mars, Jupiter and so on. Extreme weather is a familiar topic here in the Crescent City. At one panel Wednesday a city planner warned that the flood control infrastructure is nowhere near adequate for the perils ahead. Many scientists have urged that the government improve flood maps — they’re out of date and no longer capture the new reality of the warmer world. “They have not been improving the maps as they should. They’re treating that as static,” said Columbia University research professor Suzana Camargo, an expert on extreme weather. And flood maps are just maps, by the way: “I’ve never met a molecule of floodwater that could read a flood map,” said George Homewood, a planning director for the city of Norfolk. The meeting had numerous sessions Wednesday devoted to late-breaking research on hurricanes Harvey, Irma and Maria. Scientific research usually takes longer to cohere, but 2017 was an astonishing year of natural disasters and many people dropped what they were doing to tease out early findings about the hurricanes and other tumult, including western U.S. wildfires. Hurricane Harvey hit the Texas coast near Corpus Christi on Aug. 25 after it intensified rapidly in the Gulf of Mexico. The storm then stalled and dropped record rains for the better part of a week on Southeast Texas before finally drifting north and dissipating. The storm flooded Houston and much of the region and was one of several hurricanes that slammed the United States during a volatile 2017 season, including Hurricane Irma in Florida and Hurricane Maria in Puerto Rico. “Climate change made this event more likely and heavier,” said van der Wiel. Van der Wiel and her colleagues concluded that a deluge such as Harvey would have occurred in the region once every 2,400 years in the pre-warming period, but that it is now a 1-in-800 year event — and is becoming more likely. There are uncertainties here — the boost in rainfall could have been somewhere between 8 and 19 percent, according to the scientists based in the Netherlands. That 19 percent figure is at the lower end of the range calculated by the scientists from the Lawrence Berkeley National Laboratory. They said their best estimate was 38 percent but cautioned that this is science done on the fly after a major natural disaster. The teams worked independently and used different methods — for example, examining different geographical areas, different time periods during the week that Harvey struck Texas, and framing their findings with different standards of certainty. Though their numbers are not identical, the scientists on the two teams emphasized that each study bolsters the other, with strikingly similar conclusions and lessons for the future. “We have two independent efforts with essentially the same answer,” said Wehner. The textbooks declare that for every degree Celsius increase in atmospheric temperature there should be 6 to 8 percent more moisture in the air. That’s roughly the amount of global atmospheric warming in the past century. 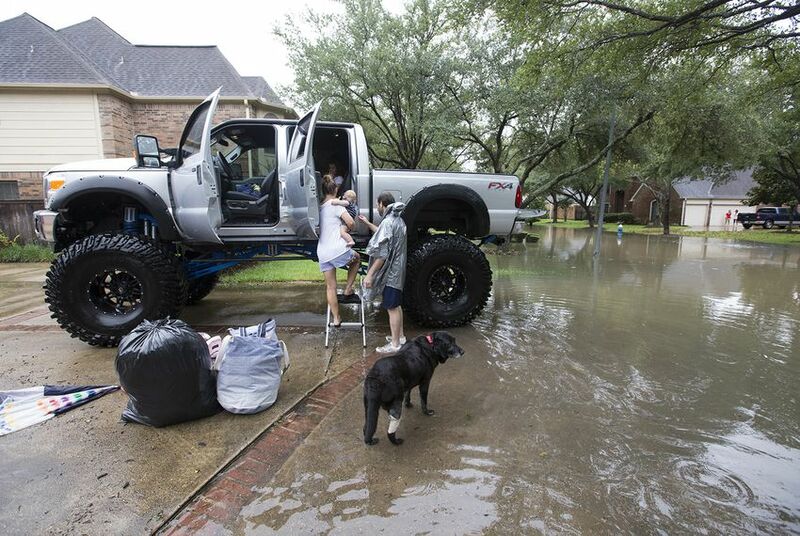 Wehner said he guessed, when he started his research, that Harvey might have dropped about 6 to 8 percent more rain than an identical storm would have dropped in 1950. But both the Dutch and Berkeley teams found the actual rainfall to be much higher than expected. This is not the first time scientists have said an extreme weather event has a signal of climate change. Wehner said the 2010 Texas drought was an event twice as likely due to climate change. And floods in September 2013 in Colorado came after rainfall that was 30 percent heavier that should be expected, he said.